The slopes of [R440R, Sun Valley Resort] had more than hikers and bikers on them this summer. Crews set out glading parts of the forest on Mt. Baldy, and work on Dollar Mountain will add more features to the terrain park this winter. Forest thinning on Mt. Baldy this summer produced new glades for skiers. Thirty acres were thinned adjacent to Upper Limelight and Olympic, between Olympic Lane and Olympic Ridge, and in Upper and Lower Central Park. Those thinned areas, which typically work as powder traps in snowstorms, will serve as new glades for skiers and riders this winter. Other forest work produced new Adventure Trails for kids on Mt. Baldy. The themed trails target children ages six to 12, but they are open to any skier or rider. The trails are marked at the entrances and exits, and the skill level required to ski or ride the trail is posted. Kids will find the new Red-headed Woodpecker Trail located in the trees between Broadway and Lower Christin's Silver. The Huckleberry Bear Trail sits just off Olympic Ridge. Lower College, French Dip and Warm Springs harbor other new adventure trails. 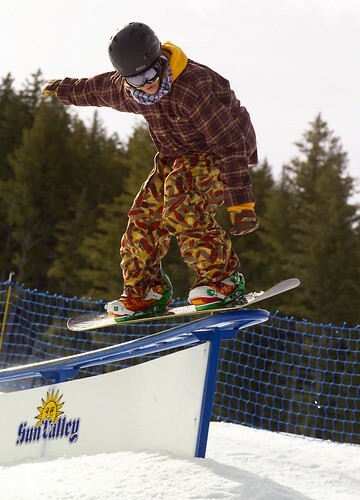 Sun Valley plans to add more rails to the Dollar Mountain terrain park for this winter. Photo Courtesy of Sun Valley Resort. Dollar Mountain improvements beefed up an already impressive terrain park that contains a cross-course. This year's additions include 20 new rails and the new Progression Park on Dollar Face that will be home to small features for beginning park riders and kids. The halfpipe will also be moved to the top portion of Old Bowl. After dropping through the halfpipe, riders can hit two new jumps and new rails in the bottom of Old Bowl. The Quad Wall, which appears in Level 1's After Dark movie, will also return.